More and more I'm realizing how important it is to spoil yourself and make "down time" or "me time" a priority. There are so many simple ways to treat yourself and one of my favourite ways is with luxe bath and body products. I find vanilla and lavender scented products so calming and I'm always on the hunt for new bath bombs to love. 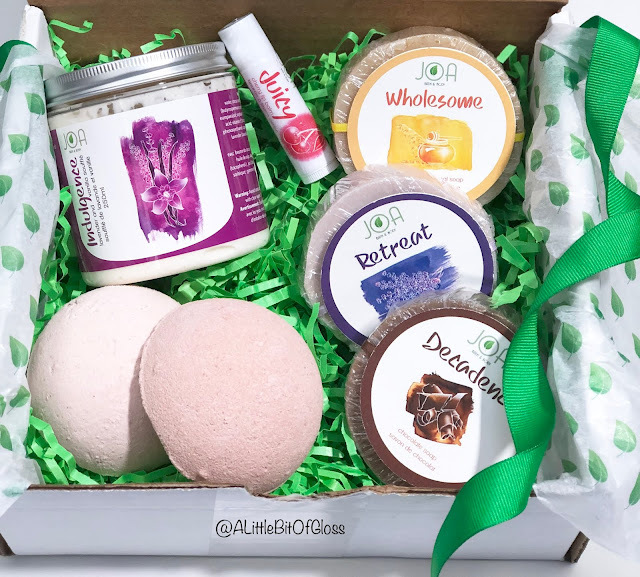 I got a lovely package from the Joa Bath and Body team and I couldn't be happier to test these goodies and offer my review for you to enjoy. When I first opened the box I was impressed with how lovely everything smelled. It wasn't an overbearing fragrance, but I did notice a soapy but pleasant aroma. The packaging is really cute and I loved the gentle reminder to "be good to yourself". Oh yes, I really needed to see this message today and I hope anyone reading this can take a moment to do exactly that after reading this review! Joa Bath and Body is a Canadian brand that started in 2008. All products are made in small batches on site and is 100% vegetarian. The honey and beeswax used are ethically harvested and I can really see the amount of care that went into making these products. The first soap I used was the Wholesome oatmeal and honey soap. After getting the bar wet, I made a really nice lather that spread easily. This soap has many skin loving oils like soybean oil, olive oil, coconut oil, palm kernel oil, and castor oil. There are also large pieces of oatmeal throughout the bar which offers exfoliation as well as a nice massage. This felt so nice when I rubbed it on my back (insert drool emoji here!) This is one of the most luxurious soaps I've ever used and if you've been a long time reader, you know how much I loooooove anything with honey in it. My skin felt really moisturized after using this soap, which is saying a lot because I find some bar soaps to be really drying. A lot of times I don't feel clean after using bar soaps which is why I like using a loofah and body wash. After using the Wholesome bath soap I felt clean but not stripped. This is an all natural soap formulated without essential oils, so if you have sensitive skin, or are looking for a nourishing and exfoliating soap then this one is sure to please! After rinsing, I followed up my Joa Bath and Body experience with the Indulgence body souffle. As the name implies, this product is super luxe and oh so buttery. It took me a moment to take in the lavender and vanilla scent, but once I rubbed it on my skin it seemed to get a bit lighter and slightly sweet. It absorbed well into my skin and offered lots of nourishment. 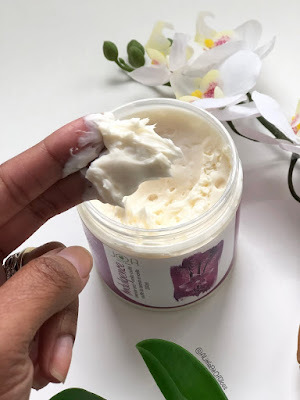 I liked that there was no residue left on my fingers and since one of the main ingredients is shea butter, I know my skin will feel good for a while! To my surprise, I noticed my skin the next morning was still hydrated! Bath bombs are a fun way to add a little luxury to your bath and I sometimes prefer bath bombs over bubbles because my skin feels softer. The Joa Bath and Body bath bombs were the perfect size for myself as well my little ones to enjoy.The half spheres were just enough to fill the tub with refreshing suds. These bath bombs are sodium bicarbonate based which means they're great for anyone looking to detox while in the bathtub. Sodium bicarbonate (or baking soda) can help relieve itching, remove bacteria and odours, help skin irritations and infections, and is naturally anti-fungal. 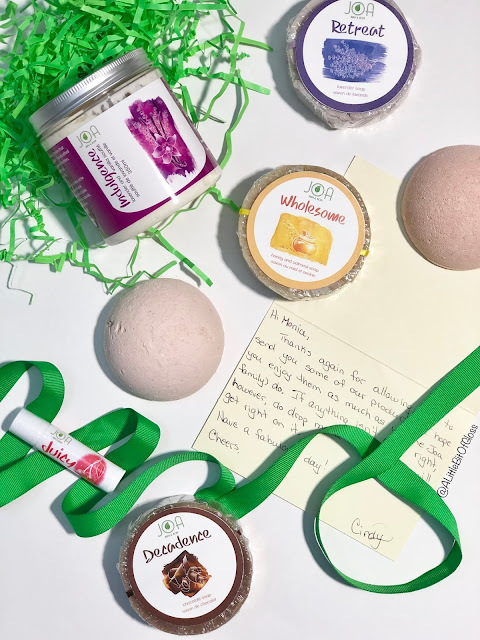 My little ones sometimes get eczema flair ups on their legs so I like letting them have an oatmeal bath or the occasional bath bomb like the Joa Bath and Body ones I got to try. If you want to learn more about what Joa Bath and Body has to offer, check out the website https://www.joabathandbody.com/. For a limited time you can get 10% off your first purchase :) What are some ways you like to spoil yourself? Let me know your fave bath and body products in the comments...I'd love to hear from you!